Because of its properties this material is well suited for spraying, dipping, or brushing, thin elastomeric films. Allow 30 minutes between coats. On completion of the extrinsic coloration to the patient's satisfaction, it is necessary to seal the coloration with silicone 4 oz. The prosthesis is painted with the TS-564 solution, this is carefully applied so as not to disturb any of the extrinsic coloring. This thin layer will cure in about 20 to 30 minutes. Since this is an acetoxy system, the curing process can be accelerated with by elevating the temperature, and introducing moisture. Once this layer is dry to the touch, a thin layer of A-564 is then applied, this layer is matted using a slightly damp gauze, again keeping the layer of A-564 very thin, and even. 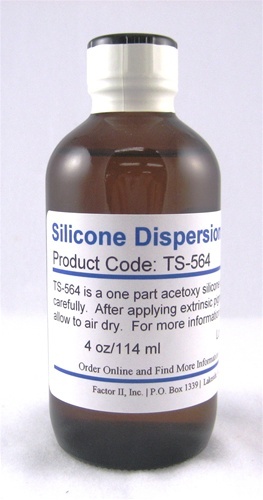 Ensure that there is no water visible on the silicone. Proceed to cure the silicone, again this can be accelerated with heat and moisture. Mix 10gms of MD-564 Fluid together with 2gms of A-564 , by weight. This will be sufficient to create a final matte to the prosthesis. Apply a thin layer of the MD-564 this will dry visibly matte but allow to cure completely. Once cured wash the prosthesis with clear soap and water, dry and the prosthesis is ready for delivery. Need the full Dispersion Kit?